Organizations that work with the personal data of European Union residents need to overhaul business processes to avoid the risks of violating the General Data Protection Regulation, which takes effect in May 2018. Penalties for non-compliance could cost your organization upwards of €20 million or 4% of total annual worldwide revenue, whichever is higher. 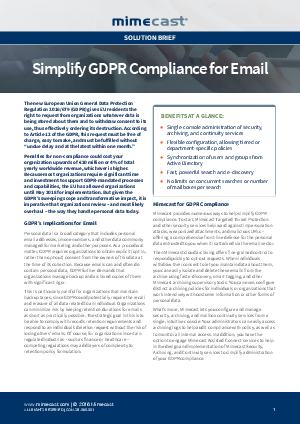 Mimecast provides numerous ways to help simplify GDPR compliance. Learn how Mimecast Targeted Threat Protection helps ward against impersonation attacks, weaponized attachments, and malicious URLs – offering a comprehensive front-line defense for the personal data entrusted to you when it is attacked via the email vector.